Adrian's Plumbing is pleased to feature a full line of products from Excalibur Water Systems, a leading Canadian Manufacturer of water treatment equipment including Water Softeners, Filters, Reverse Osmosis Systems and Accessories. Hard water has an obvious adverse effect on appliances and plumbing systems. It's easiest to see as the rock-hard scale forms on shower heads, faucets, and humidifiers, but it also builds up rapidly in dishwashers, clothes washers, pipes, and water heaters, decreasing their life. Water heaters can consume up to 22% less energy with soft water than with hard water! Soft water is gentle, beautifying, enriching. Soft water means soft, clean skin; soft, silky, more manageable hair. Hard water keeps soap from lathering as it might, working as it should, rinsing off as you want it to. It often leaves an invisible film which blocks pores, attracting and holding dirt and bacteria, causing chapping, itching, and dryness. Hair washed in hard water becomes limp and lifeless; hair coloring frequently does not penetrate evenly. Water that has been softened, however, eliminates these problems. It enables you to use lesser quantities of soap, shampoo, and skin care products, and increases the efficiency with which they work. Doing laundry in soft water has proved significantly more effective than doing laundry in hard water, no matter how much soap or detergent is used. The principle is much the same as it is with skin care; hard water combines with the ingredients of soap and detergents to form a dulling curd on clothing, one that holds soil in the fabric, shielding it from removal. It causes clothing to look dingy, grayed, or yellowed, to mat or stiffen with repeated washings. Fibers may deteriorate, wearing out at a faster rate. Nothing looks really clean; nothing is really clean! Soft water,on the other hand,activates the soap or detergent to make a smaller amount (up to 55% less!) work more effectively. Soft water aids the rinsing process, removing dirt and cleaning agents from the fiber and lengthening fiber life. Laundry washed in soft water will be brighter, cleaner, and softer! Here, too, the cleaning agents combine with the minerals in hard water to form a dulling film. Soft water makes dishes and glassware shine - hard water spots are eliminated. And you use only half the amount of detergent or soap hard water requires. Studies have proven that softened water cuts the time required for housecleaning from almost 4 hours to less than 2 1/2 hours! With soft water, a quick rinse or onceover wiping cleans sinks, tubs, shower tiles, and plumbing fixtures - no more hard water soap scum to scour and scrub (no more harsh chemicals, either). Floors, windows, and woodwork clean better with soft water, too. 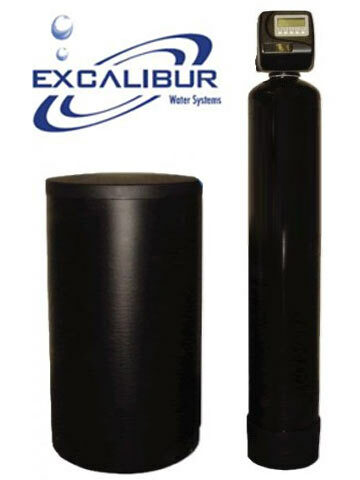 For more information regarding the Excalibur line of Water Softeners, please visit the Excalibur Website.